The Bible is a war manual. You don’t have to read very far before you discover that there are, as Chuck Colson once noted, “kingdoms in conflict.” The spiritual life is referred to as a battle, and (as descriptions of Armageddon clarify) Jesus is not just Lord of your life, He is a Lord of War. Of course, the weapons with which this spiritual war is waged are quite different from those issued by the Armed Forces. But while watching the film Act of Valor, it occurred to me that Christians could benefit from revisiting some of the military metaphors that undergird their theology and practice. The personal peace and prosperity gospel preached from many pulpits, the easy believe-ism touting a nearly risk-free encounter with God, sedates many believers, making them unfit for the fight. A film like Act of Valor, rightly viewed, can be a real wake-up call. Act of Valor stars real, active-duty Navy Seals. And if the occasional forays into actual acting are only so-so (not a crushing critique in the era of models-turned-actors), it is the action, and the discipline that makes such warfare possible, that brings the screen alive. In Act of Valor audiences are watching trained warriors, who willingly leave the safety of their homes, to risk their lives in achieving a single-minded mission. Though you never see it in the film, every move these soldiers make speaks of the intensive training they have received. No one just picks up a gun and some C-4 explosives and becomes a Navy Seal. During one key action sequence, audiences are initially baffled at the way one of the Seals approaches his target (to give more away would spoil it). Why would he do such a thing? It makes no sense! It is only after the maneuver is completed that you see the wisdom in the approach. These guys are consummate warfare professionals. They are the best, because they are disciplined and well-trained. In a Bible study last night, one member of our group despaired that there is no “boot camp” for Christianity. You join up, and you are immediately in the fray. It did not used to be so. Not long ago, Christians engaged in spiritual disciplines. They included practices such as prayer, fasting, silence, self-control, and worship. Unfortunately, for many, these disciplines became ends in themselves, and sources of spiritual pride. In the name of spiritual liberty and freedom, many of these practices were abandoned. When the military trains, they place less experienced soldiers under the command of a more experienced warrior. In Christianity, we used to call this program “discipleship.” But in many churches, the professional pastorate has taken the place of personal discipleship. Can you imagine what might happen if everyone from the buck private to the sergeant, from the lieutenant to the colonel, relied on the general for all of their training? No wonder the rate of burnout among pastors is staggering. The Schaeffer Institute reported in 2006 that 81% of the U.S. pastors surveyed reported that there was no active peer-to-peer discipleship program at their church. Is it any surprise that Christians are often unfit for spiritual battle? If Christians want to prepare for spiritual warfare, they need to find a mentor. The Apostle Paul offered himself up as someone whose life should be imitated, to the degree that Paul’s life imitated Christ. We are past the time when we should view all Christians equally. Some are farther down the path, and more successfully in the fight than others. Those who are weaker need to learn from those who are strong (Hebrews 12:4-13). That is how an effective unit is trained to enter the fray. As Act of Valor opens, the voice-over narrator explains that the worst thing about growing old is that people no longer find you dangerous. If you ever wonder whether the original apostles were dangerous men, just look at how they were treated. Both the Jewish hierarchy in Jerusalem and the Romans were threatened by this new, robust faith, and so sought to destroy it. It isn’t as if soldiers could not choose safety. One of the most touching scenes in Act of Valor shows the Seal team members at home with their families, and playing with their children at the beach. Battle-hardened in the field, they are tender toward their spouses and kids when at home. Were they to remain at home, in different occupations, they would be safe – at least as this world defines safety. 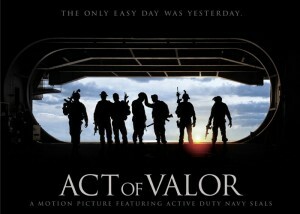 But the heroes of Act of Valor set safety aside and choose the mission. Their willingness to do so, to save the lives of others, and to protect their fellow citizens from catastrophic harm, is admirable. How much more should Christians be concerned about the outcome of the battle in which they are engaged? Jesus told His followers not to fear the one who can kill only the body, but to fear the one who, after killing the body, can throw the soul into hell. (Matthew 10:28). Instead of being afraid of how we will be received by the world – the very world we are sent to transform – we should put on courage, knowing we are doing the will of God. We need to be willing to risk. In a stirring letter home to his newborn son, one of the Seals quotes Chief Tecumseh, “So live your life that the fear of death can never enter your heart.” The Navy Seals in Act of Valor do not go off to battle with a wanton disregard for their own lives. That would be foolishness. It is their passionate desire to safeguard innocent lives that ultimately motivates their actions. They are like the Rangers in Lord of the Rings, placing their bodies on the line so that unsuspecting citizens can live out their lives in peace, unaware of how much is risked by others to ensure their safety. In the West we have an obsession with longevity. Our multi-billion dollar medical establishment is dedicated to making sure that everyone draws their last possible breath. But is long life the ultimate goal? Isn’t it better to fight the good fight, even if one dies in the process, than to live long in safety and ineffectiveness? Jesus told his followers that those who hold too tightly to their lives will lose them, but “whoever loses his life, for My sake, will save it” (Matthew 16:25). As the testimonies of millions of disciples and martyrs can attest, this command is daily followed, both figuratively and literally. As Dietrich Bonhoeffer famously wrote in The Cost of Discipleship, “When Christ calls a man, He bids him come and die.” The Seals in Act of Valor are not some band of suicidal brothers seeking death, but they do not fear it, and it will not stop them from completing their mission. Can we say the same? As they prepare to head off into battle, the Seals gather at the beach. They are admonished by their leader to leave nothing undone in their home lives. If there is anything going on that will distract them from the tasks ahead, they are to seek help and make sure it is handled before they go “down range.” Once the mission begins, all members of the team expect a single-minded vision. By contrast, the average Christian in the West is bombarded by distractions. It is so common that many of us have become used to, and even find comfort in, their familiarity. We rarely use words such as strive, battle, struggle, or fight about our own inner lives, instead reserving those verbs for competitive sports. Some of us have been out of the battle so long that we have forgotten the mission. Instead we are intently listening to the worldview that pours out of the media: that your faith is an intensely personal, private affair. And if the Gospel can be thus contained, it can be rendered safe — and the assault by the Adversary on the souls of humanity can continue unabated. The Apostle Paul reminds us that safety and ease are not to be the hallmark of the Christian life. We are in a battle, on a mission. Using one of his many military metaphors, Paul tells his lieutenant Timothy, “Suffer hardship with me, as a good soldier of Christ Jesus. No soldier in active service entangles himself in the affairs of everyday life, so that he may please the one who enlisted him as a soldier.” (2 Timothy 2:3-4). How do we please Him? By committing ourselves to His commission to spread the Gospel and make disciples (Matthew 28:18-20). Christians are to be kind, loving, gentle, and looking out for the best interests of others. But never mistake morality for softness. There is danger, a threat to the present world order, in every act of obedience to the Lord. The love of Christ led Him to the cross. The love of Stephen for his fellow Jews, and the love of Paul for the Gentiles, resulted in their martyrs’ deaths. They risked their two mortal lives, and how many souls have been saved as a result? Every self-denying act, every Christ-centered marriage, every honest business deal strikes a blow against a world that says it’s all about you, seek your own happiness, and that the only measure of success is ending up on top. Act of Valor is about real warfare, men risking their lives, abandoning personal safety, in order to achieve their mission objective. If the Church is to continue to exert influence in this part of our dying world (there are other parts of the world where it is battling mightily), perhaps it is past time that we revisited the battle imagery that we find in Scripture. Old spiritual warriors must bring up the new recruits to ready them to join in the fight, heeding only their Commander’s call, willing to daily deny themselves in order to move the battle lines, and rescuing the dying by bringing them into the Commander’s camp.